Some of the worst mistakes newcomers to the Atlantic Intracoastal Waterway make come from reading the guidebooks. And some of the worst mistakes come from not reading the guidebooks. Too many things change along the ICW to depend on last year&apos;s, or maybe even yesterday&apos;s, information. But this is part of what makes the trip always exciting. It still is to my wife and I, even though we&apos;ve been traveling the ICW for many years. Channels change; marshes evolve slowly, as in primordial times; small towns reinvent their waterfronts; marinas add docks, services and restaurants; forests sometimes lose way to development; and a few still increase their population of alligators, bears and bald eagles. To repeat an oft-used phrase, it&apos;s a movable feast. But as you chew the succulent oyster, you don&apos;t know whether the thing that&apos;s going to crack your tooth is a pearl or a broken shell. The following are a few of the problems we&apos;ve noticed during the last few years and some of the highlights that overshadow the problems and make the trip so very worthwhile. Let&apos;s start with some problems. ICW travel takes much more than just driving. It takes an understanding of the natural forces affecting the channels, daily updating as to what is ahead and good seamanship. The latter takes learning over time. The first two require resources such as guidebooks (notice I use plural), updated charts, which you carefully study before you need to know what they tell you, and on-scene savvy and constant checking ahead for the latest information. 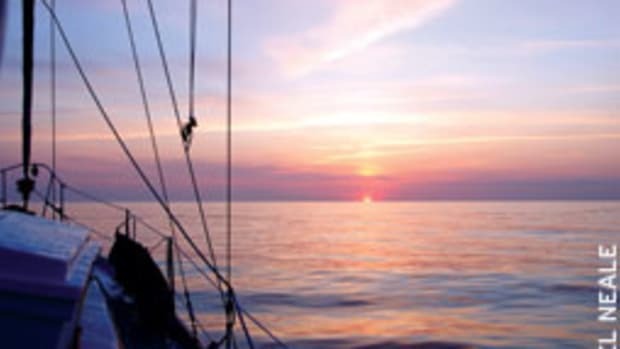 You can check by communicating with other cruisers, by listening to regular and unscheduled Coast Guard Securitee broadcasts and by going to reliable websites. Although there has been more dredging in the last couple of years, depth issues still exist and always will. 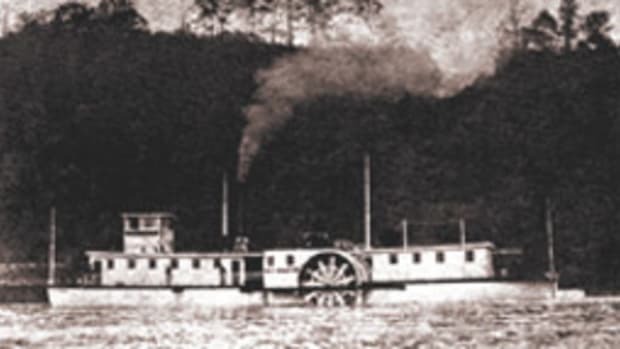 To illustrate the ever-changing depths, hence the unreliability of much information, consider Hell Gate, a dredged crossing between Raccoon Key and Little Don Island connecting the Vernon and Ogeechee rivers just south of Savannah, Ga. There was dredging in late 2009, but while we passed through in April 2010 at low tide, some of the markers were actually out of the water, although the depths were good if you were in the right place. By November we noticed that even the deeper areas seemed to be filling in already. The following is a representative list of improved and still bad areas. Unfortunately, reports of extreme shallows aren&apos;t always reliable. This is because far too often the skipper, eager to help, was simply in the wrong spot and didn&apos;t have the experience to know it. We&apos;ve read many reports of shallow water through the years that weren&apos;t accurate because of this. Examples include the northern entrance to the Alligator River (from Albemarle Sound) in North Carolina, and Cumberland Dividings, a narrow, shallow passage connecting the Cumberland River with Cumberland Sound in Georgia. In both of these areas the channel has changed in recent years, but we repeatedly see people ignorantly following their outdated charts straight into shoal water. They then file shallow-water alarms on various websites when, in fact, they should be updating their charts. In some areas, such as lower South Carolina, Georgia and northern Florida, the tidal range averages about 8 feet. This can be helpful. To add to the confusion of some, there&apos;s the legendary "magenta line" drawn on some ICW charts to indicate the track through deepest water. But that symbol was developed years ago. Today, the magenta line sometimes passes on the "wrong" side of markers because the markers have been changed to mark deep water where it is now. We&apos;ve heard people complaining about going aground when they blindly followed a magenta line on an old chart or their chart plotter rather than do what the markers indicated. In some changeable areas, the magenta lines have been removed from charts entirely. Florida depths are generally more stable because the Florida Inland Navigation District contributes tax dollars for dredging. But there still are some constantly recurring problem areas, such as a spot just to the south of Fernandina Beach and the Matanzas Inlet/ICW junction. In recent years, it has become relatively inexpensive to keep your navigational information current. The Army Corps of Engineers regularly surveys, using highly accurate recording equipment, and reports shoaling. Notices to Mariners are broadcast via VHF by the Coast Guard - stand by on channel 16 (as the law requires) and switch off to 22A when you hear an announcement. In addition, BoatU.S. publishes "East Coast Alerts" on its website. Check out summaries of the late-breaking reports for free. You can sign up to have them e-mailed to you for no charge. See www.boatus.com and search "East Coast Alerts." You can also order our "Cruising the East Coast with Tom Neale" two-DVD set, which covers much of the ICW. Order it on www.tomneale.com. Chart plotters also are helpful, but like any tool they should be used properly. We love our Standard Horizon CP300i, with C-MAP Max cartography. It&apos;s made life much easier out at sea and in the ICW. But any plotter has its limitations, particularly in the narrow channels of the ICW. It isn&apos;t unusual for any chart plotter to place your vessel on dry ground, marsh or shoal in some ICW areas. This isn&apos;t the fault of the plotter; it&apos;s simply a natural consequence of the area. And there&apos;s another anomaly that many don&apos;t expect until much too late. Plotter screens must refresh as you move along. Traveling a very short distance in the ICW can put your boat in drastically altered circumstances, such as from 20 feet of water to 1 foot. We recently listened to the distress call of a very expensive, fast yacht speeding to meet a schedule in Florida. The yacht had run onto a shoal that&apos;s bare at low water. After it was extricated from the expensive grounding, the skipper was heard to complain that his chart plotter hadn&apos;t refreshed quickly enough and that he hadn&apos;t been able to see the shoal on the screen. Given the rapidly changing bottom and the speed of the boat, this was probably true. But if he&apos;d been looking where he was going - i.e., out ahead and at the buoys and the change in water color - he wouldn&apos;t have had a problem. It&apos;s often a surprise to the uninitiated that ICW waters aren&apos;t always protected. Albemarle Sound in North Carolina is notorious for steep, wicked waves caused by high winds and shallow water. Even large tugs sometimes wait for relatively calm weather before crossing. The Neuse River, to the south, can become very rough in strong winds, particularly as it meets Pamlico Sound and the route takes you way out and around the treacherous shoals of Maw Point. And traveling from Jekyll Island to Cumberland Island takes you out almost into the ocean in order to get around the shoals of St. Andrew Sound in Georgia. On a strong northeaster or easterly, and particularly with an outgoing tide, the incoming waves break all around you in water only a few feet deep and a few feet away from your channel. Many like to run outside in the Atlantic for a day or several days. It can save time if the weather&apos;s good and give you a break from the point-by-point steering typical of much of the ICW. But it&apos;s important that the weather forecast not only be good when you leave, but also when you plan to come into the next inlet. The larger inlets used by commercial and military vessels - Cape Fear, Charleston, Savannah, St. Johns, Lake Worth and Port Everglades, to name a few - are usually considered to be safe in normal conditions. But there are fewer and fewer safe smaller inlets because of a shortage of dredging funds. Although the minor North Carolina inlets - Bogue and New River, for example - usually get dredged each summer for local and commercial use, these are not suitable for typical ICW transients. 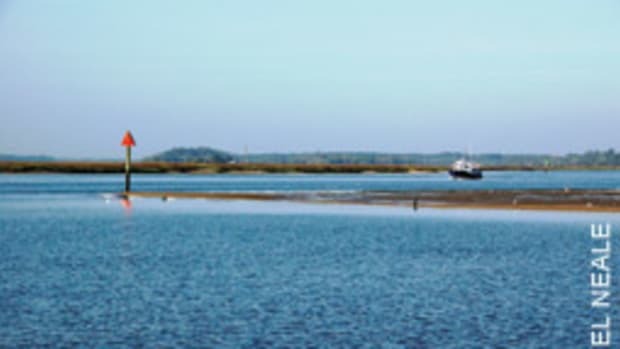 Minor inlets in South Carolina and Georgia are less likely to be dredged and more and more inlet aids to navigation are being removed because of the shifting shallows. (Examples of this are the aids in the Stono River and South Edisto River inlets, as reported in January 2011 Local Notices to Mariners.) Pick inlets using only updated information. Also consider swell conditions. A "good" inlet can be treacherous, even on a beautiful day, if an offshore storm has radiated a large swell and it is or will be breaking in the inlet. This condition is particularly bad when the tide is running out against the swell. Housing and condo projects have, in my view, relentlessly marred the shores of the ICW and even hindered navigation. Although there are still relatively untouched marshes, woods and wilderness areas, places that we thought would always be safe from the encroachments of construction now sport monstrous new houses and towering condos. The concept of waterfront living has been stretched to the absurd. 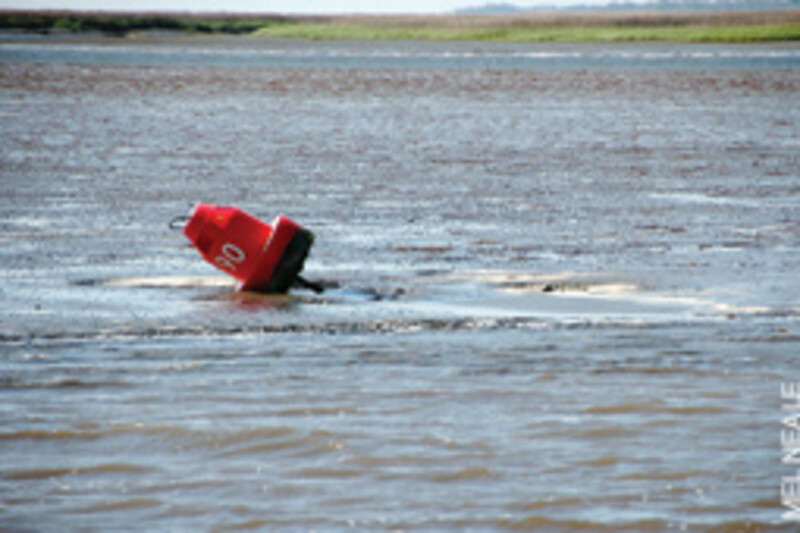 One example is seen on the shores around and south of the "Rock Pile" in South Carolina. Named Pine Island Cut on the charts, this was one of the last sections of the ICW to be created and it was essentially blasted out of rock. The channel is very narrow and even slight deviation from dead center can hole your boat or remove your running gear. Until recently, the shores were tree-lined and a feeling of isolation surrounded you as you carefully threaded the waters. Today there are houses, docks extending out, and myriad boaters, some on short-term rentals, racing up and down without a clue to the issues. One result of the rampant development is the proliferation of restricted bridges, which seem to be becoming more problematic than shallow water. Some of the bridges are high-rises (a 65-foot vertical clearance in theory, but not always), while others must be opened for most cruising boats. In many areas, having a bridge not open when it should is more than an inconvenience. It can result in safety issues involving damage to property and injury to persons. New bridge construction often results in blockages of ICW traffic, sometimes for days at a time. Once a new bridge is built, unless it&apos;s a high-rise and doesn&apos;t need to open, the local populace quickly comes to the conclusion that even though civilization got along quite well before the bridge was ever there, now they are unacceptably inconvenienced by having to wait while the bridge is opening for boats. Mr. Jones must stop in his climate-controlled car. The highway doesn&apos;t move him about as the current moves a boat trying to hold in place. The wind doesn&apos;t blow him to the side, as it does a boat. He doesn&apos;t have to desperately jockey around to avoid other cars doing the same, as is the case with multiple boats trying to hold place in typically narrow channels. He doesn&apos;t have to worry about running aground. His vehicle doesn&apos;t need prop thrust against a rudder to control his motion. And if the delay (only a few minutes) causes him to travel in the dark, he just turns on his lights and follows the highway, unlike the boat, which has to find buoys, avoid debris and stumps on the side, and compensate for drift and shoals. If the delay means he has to drive in an approaching storm, it&apos;s no problem; he&apos;s in a car. Soon he starts petitioning local politicians to restrict the bridge openings to schedules that better suit his convenience. Often he&apos;ll want no openings during "rush hour." After all, why should he have to leave home a few minutes early to cross the water near which he chose to live? Some bridges are restricted for two or three hours, morning and evening. The latter is particularly a problem for a boat, which needs to reach safe harbor before dark. A telling example involves the 80-mile stretch of the ICW between Beaufort and Wrightsville Beach, N.C., where there are four restricted drawbridges and a Marine Corps firing range (with artillery firing across the ICW) that often closes the waterway. Two of the bridges (Surf City and Wrightsville) open only on the hour and two (Figure Eight and Onslow Beach) open only twice an hour - on the hour and half hour. Distances involved mean that displacement boats have a difficult time transiting this stretch in daylight hours. There are only a few marina transient slips and one anchorage (a poor one) along that stretch. Most of the ICW in this area has a narrow channel, strong current, is subject to periods of strong wind (being close to the ocean), has poor holding for anchoring of boats of moderate to larger size, and no space to anchor, except in the channel. When a displacement vessel is trapped at a bridge, it is often very difficult to hold in place and wait. The difficulty is increased with single-screw vessels, of which there are many. Increasing restriction to passage on this route would make safe transit even more difficult. Yet a local homeowners association recently requested that one bridge in this route that was already on an "hour and half hour only" schedule be restricted further so that it would only open once an hour. The request was made because the members felt that such would be more convenient to them, avoiding an occasional extra few moments of sitting in the car waiting for an opening. Fortunately, the proposed change was rejected. To further complicate matters, bridge openings revolve around the bridge tender. Most of these are good people trying to do their job well. But there are notable exceptions. Most of a bridge tender&apos;s friends and neighbors (not to mention his bosses) are in the cars not wanting to be delayed. He seldom makes a great salary. He has seldom maneuvered a large boat, if any at all. Often he does not understand the federal regulations that dictate his opening hours. We recently experienced this at a South Carolina bridge that is a constant problem because of its age and restrictions. The Federal Register provisions then in effect said the bridge should open at the time we arrived. We knew this from the Coast Guard&apos;s Local Notices to Mariners and our access to the regulations. He refused to open, in clear violation of the law, and indicated that he would continue restrictions the next day, although it was specifically exempted as a federal holiday. We circled in deepening darkness. The bottom was too hard to anchor. Finally we were allowed to feel our way in total darkness to the first available anchorage on the other side of the bridge. We were very fortunate that there had been no storm. This person was pleasant and wanted to be helpful; he just didn&apos;t understand the regulation - or his bosses hadn&apos;t provided him with the latest. Sometimes bridge tenders can be particularly unpleasant. Sometimes they even have phantom traffic. They have told us that they cannot open (when they&apos;re on an "open on demand" status) because of vehicular traffic when, in fact, there was none. We experienced this a few years ago at the Little River Swing Bridge and another time at the Socastee Bridge, both in South Carolina. These drawbridges were supposed to be removed after the community requested and got very expensive high-rise bridges a few hundred feet away from each of them. When the new bridges opened, local authorities decided to keep the old bridges operating. Some bridge tenders insist that you bring the boat "up to the fenders" before they will open. Often this is dangerous because of lack of maneuverability and wind and tide pushing you into the fenders. Boaters have a tendency to ignore these problems, anxious to be on their way without hassle. But problems with bridges and bridge tenders should be reported to the appropriate Coast Guard oversight office. If not, the problems are likely to worsen until safety issues develop for other boaters. For the Atlantic ICW, there are two Coast Guard bridge offices tasked with the Herculean job of oversight of the many bridges under their jurisdiction. They must strike a balance among varying interests, but they are very mindful of issues involving vessels in transit and do a great job trying to resolve problems. 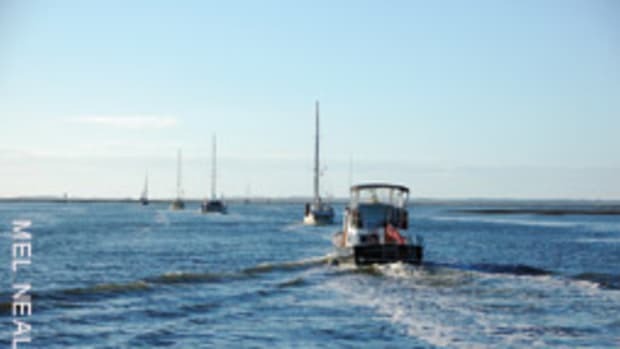 Through the years, we&apos;ve seen that their services are invaluable to boaters. Without them, movement of maritime traffic on these navigable waters would be at the mercy of every local politician. But many boaters aren&apos;t even aware. And now for the good things. Just the travel along the ICW is wonderful, watching myriad scenes slowly pass by as you cruise through this historic and beautiful section of our country. But the stops along the way make it even more special. The following are but a few examples. The Beaufort/Morehead City area of North Carolina is strategically located for heading out Beaufort Inlet and going south outside. It&apos;s also a good place for repairs, provisioning and enjoying the marsh and beaches representative of the Outer Banks area. (You may want a well-found dinghy for this.) We usually stop in the protected basin at Morehead City Yacht Basin (www.moreheadcityyachtbasin.com). It has a handy loaner car, sells ValvTect fuel and is located near area restaurants and shopping. Bald Head Island, with its marina, is at the Cape Fear River Entrance and is one of the more unique places on the ICW (www.baldheadisland.com). There are restaurants and the historic "Old Baldy," the oldest lighthouse structure in North Carolina, is open as a museum. The view from the top - 110 feet high, overlooking Frying Pan Shoals and part of the Graveyard of the Atlantic - is something you&apos;ll never forget. Rent a bike or golf cart and explore the island, including trails through forest standing as though untouched for centuries. The small town of Southport, with its Southport Marina (www.southport-marina.com), is across and just up the Cape Fear River. Many movies have been filmed here because of its historic homes and special places, such as its ancient graveyard. 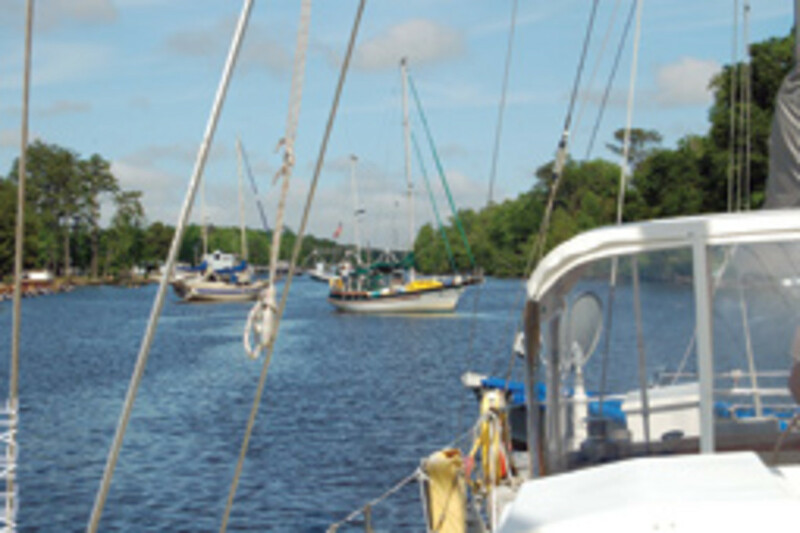 Up the Cape Fear River lies Wilmington, one of the true Southern cities of the ICW. We stop in the protected basin of Wilmington Marine Center (www.wilmingtonmarine.com). The river beyond the city takes you into a nearly subtropical wilderness, with plants and creatures perhaps far different from what you might expect. Charleston, S.C., just inside a big ship inlet, offers spectacular dining and enriching historical perspective. Its popular Charleston City Marina (www.megadock.us) is convenient to the ICW and provides free transportation about the town for its customers. Beaufort, S.C., is a historic, beautiful town overlooking the banks of its river. Port Royal Sound provides a good inlet. Downtown Marina of Beaufort is in the historic area; nearby Port Royal Landing Marina (www.portroyallandingmarina.com) has a loaner car, ValvTect fuel and is close to good grocery stops and other shopping, including a West Marine. 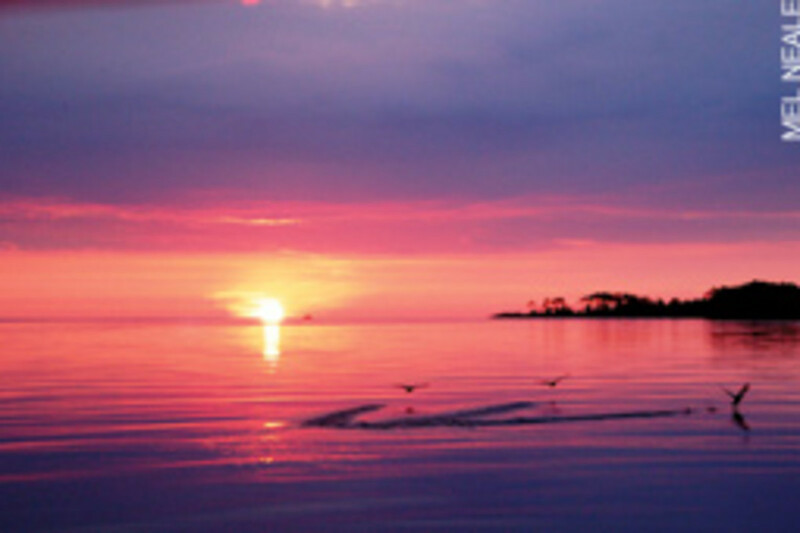 Although everyone knows of South Florida and the Keys, North Florida is an exciting area that&apos;s often overlooked. It was here that the French, Spanish, British, American Indians and pirates waged constant battles and skirmishes for control of the coast for generations. A side trip up the St. Johns River can be fascinating. We usually explore this area from the protected basin of Camachee Cove Yacht Harbor (www.camacheeisland.com) in St. Augustine. Competitively priced ValvTect fuel, three boaters&apos; lounges, a popular restaurant and two loaner cars (a Lexus and a minivan) are but a few of the features that bring us here. Soon a new Publix will be in walking distance. There&apos;s also a full-service yard tucked away in a corner with a 50-ton lift where we&apos;ve had many jobs well done. The more civilized attractions are richly complemented by wilderness areas. You can take a side trip, beginning around Mile 7, through the great Dismal Swamp, exiting at cruiser-friendly Elizabeth City. The shores of the Alligator River, just to the south of Albemarle Sound, seem remote and desolate. In the Alligator River-Pungo River Canal we&apos;ve seen bears, deer, turtles, snakes and other creatures in the dense swamps close in on both sides of the channel. 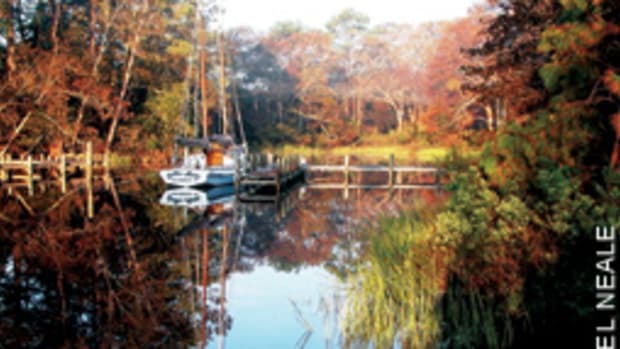 The Waccamaw River, before you reach Georgetown, S.C., is beautiful beyond comparison. 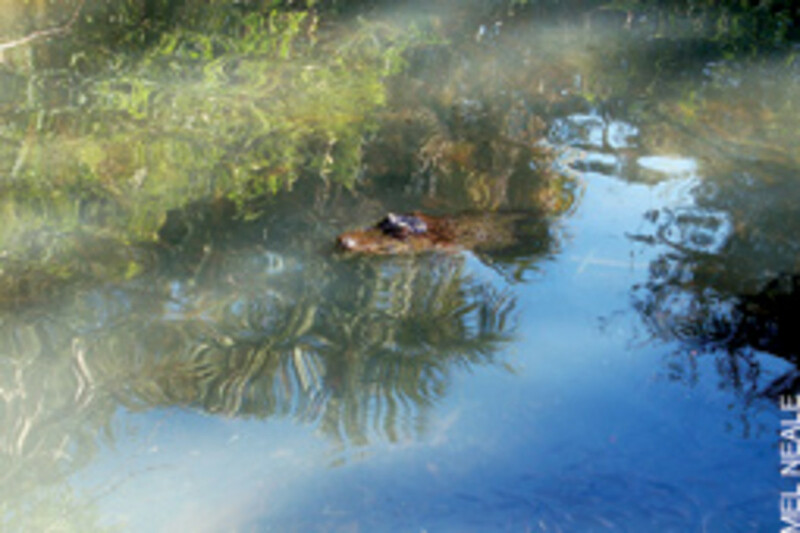 Exploring its creeks by dinghy from your anchorage can be like a tropical jungle experience, but don&apos;t get lost and don&apos;t step ashore into a mess of gators and snakes (see "The Waccamaw River and Wachesaw Landing," Soundings 2007). Cumberland Island, the southernmost barrier island of Georgia, provides another exceptional wilderness experience. A large part of the island is a federally protected wilderness preserve. There are ample paths, but you definitely know you&apos;re in a wilderness. You&apos;ll see wild horses, armadillo, wild turkeys, snakes and many other creatures you might imagine - or not. Visit the quiet ruins of the ancient, magnificent plantation house, Dungeness, at the south end. The beach seems endless and often there are no people. You&apos;ll have to anchor and come ashore by dinghy to the rangers&apos; landing dock. People from the mainland come by ferry, but don&apos;t expect to find crowds in this haunting place. We&apos;ve been there often when we&apos;ve had the beach and the dark trails through deep forest all to ourselves. The ICW is a priceless national treasure for many more reasons than you may think. Its value far exceeds good cruising. In World War II it was, for a time, the only way maritime traffic could travel the East Coast without fear of U-boats. It has always been a highway not only for distance transport of goods, but also for government use and for bringing business to waterfront towns and cities. And it is very important for the environment. For example, according to a report by the Atlantic Intracoastal Waterway Association (www.atlintracoastal.org), the Allegheny Institute for Public Policy found that waterway transport of cargo is the least expensive, produces the least pollution and is safer than highway transport. 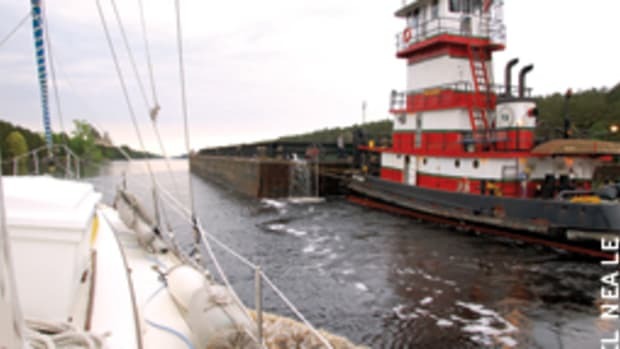 One study showed that, on average, one barge can carry as much cargo as 58 trucks. The same organization has shown that transporting cargo by barge produces exceptionally low airborne pollutants compared with trucks or trains. Dredging budget cuts by the federal government recently came close to killing the ICW. Because shoaling is an ongoing process, delays in dredging exponentially increase the problem. Dredging decisions have been based on commercial cargo tonnage only. Dollars to communities and businesses, which are derived from the huge pleasure boat usage, haven&apos;t been considered. And the greater the shoaling, the less commercial traffic can use the ICW, a classic U.S. government "Catch-22." The project depth for the Atlantic ICW between Norfolk, Va., and Fort Pierce, Fla., is 12 feet mean low water; then 10 feet mean low water to Miami. But you can&apos;t count on that today. Like so many of our valued assets, the ICW is threatened. This means that I&apos;m glad I was here before and will relish every moment spent on it. We&apos;re traveling on the ICW as I write this. It may mean to you that you should take the trip sooner rather than later. In either event, traveling the ICW is still an incomparably fascinating, beautiful adventure.